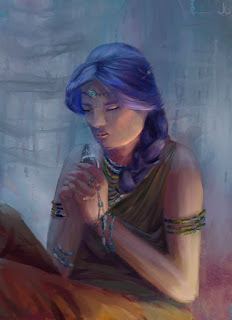 I need reasons to post images in this blog, so when I paint something that's not immediately related to an article, they may lie around for a while. But of course I do a lot of sketches and speedpaintings for Genius Loci, and have decided they might as well be posted on deviantArt. For now, there are the illustrations for the Broken Jaw Rocks (already published here), Insanity (also blogged), and Area Gate, a surreal piece for Genius Loci's mindscape. Why do I tell you this? Because the quotes are never the same, and you might just learn something new about Genius Loci. Whisperers have been described as the juvenile form of speakers. Indeed, whisperers that become powerful enough eventually turn into speakers, losing their abilities in exchange for the capacity of channeling the Fifth Power into spells. Whisperers are born, but one cannot learn to be a whisperer, while becoming a speaker is possible to anyone. Whisperers' abilities are always limited in number and strength. Some whisperers go to great lengths to keep their skills just low enough to not become speakers, to avoid the inevitable fanaticism both traditions are stricken with. "I change the Fifth Power. My family forbade me to learn a profession, to marry, to have friends with strange ideas. I will live for nine centuries, and I'll never be anything but the power source for the speakers of my clan." Whisperers' abilities are any of: resistance or complete immunity to mental control; empathy; telekinesis; shapeshifting their appearance; incredible physical resistance; manipulating the Fifth Power's strength; teleportation; silvercords; reading objects' past; supernatural combat skills; nearly irresistible skills of persuasion; artifact creation. All whispering skills are limited to the user, they cannot use them outside of themselves. Therefore, while their teleportation is by far the most reliable, they cannot transport people with them, and cannot lift anything with their mental touch, but only protect or enhance themselves. Whisperers are subject to the mystical number five - mastership of five skills makes them speakers. They are treated wildly different throughout the cultures; some employ their unique talents like regular jobs, others see a duty for them, still others fear them, or value their talents but disregard the whisperers' individuality. "Damned spells! I could jump from here to a room in Agorisai without fail when I whispered, now I can barely see the city upon my arrival!" I wonder how it must be to have the choice to either never further your abilities or become a fanatic. Glad I don't have to make it. Whisperers' most important ability is to make artifacts - one could say that most have been made by them, although there are no more whisperers than speakers, who also can make them. And also with some WIPS and sketches on cgsociety. "Some think the lands of fire must be hot. Parts of it are; mostly it's northern and cold, but the Sawan houses are always warm. And so, the seemingly aggressive nature comforts its denizens." The continent of fire is covered in evidence of its restless underground. 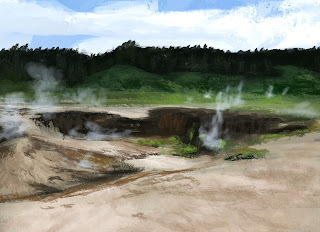 There are proper volcanoes, but also geysirs abound, lava lakes, boiling mud, and fields of tiny smoking craters; rivers or lakes may be acidic due to the volcanic soil. Much of the land is covered in cold lava or ash, has lava tunnels, covered thinly with glasslike stone, and other dangers to travellers. However, the Sawans have learned ages ago to use fire to their advantage. They reroute hot springs into their homes and bath houses, use hot air vents for drying and heating, and are very clever in building means to guide lava around what should not go up in flames. Greenworkers know the best plants to seed on ash-covered fields to break up the hardened lava. "I know eruptions can't be predicted precisely, but I was promised it would go off sometime this week - without fresh lava I don't know how to keep the schedule!" Sawa is not the only land to feature volcanoes. There are two belts around the world as well as some single or grouped volcanoes. Notably the Thrower mountains in northeast Lozir, and the Burning Islands of the Ryaq have large volcanoes. Volcanoes are so cool. 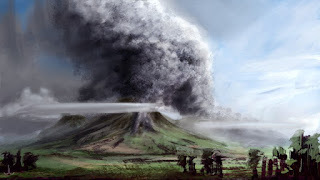 I particularly love pyroclastic clouds and the lightning inside ash clouds during eruptions, and still I'm glad not to live around any active ones. I had to pull a bit of fantasy green thumbs, though, as new volcanic soil isn't nearly as fertile as "rich in minerals" sounds. It does make for beautiful geysirs though, with colourful minerals layering on their rims.